So you want to save the world one drop of rain at a time while saving on your monthly expenses? Then you have come to the right place! Rain water collection systems are a fun weekend project for the family that are fairly easy to do. You can make it as simple as a rain barrel at the bottom of your gutter system, or as sophisticated as a buried underground tank with multiple filtration and pump systems. Rain barrels are sold all over the place, from Whole Foods, to the local flea market…even Home Depot has them now. Do a Google search or click the link here to find a company near you. It is going to be a little trickier to find a commercial grade underground tank, but take your time and do the proper research as it is going to be a big investment and project. and collect the water that comes off your roof every time it rains. The bigger the roof the better here! The first thing you are going to need is a collection basin or a tank. This can be made out of any material capable of holding water. Get creative here…unless you bury it, this is going to be a visible part of your yard. Enjoy yourself and have the kids paint it to liven up the gardens feng shui! If you plan on using it during the cold weather, make sure it is properly insulated or buried more than 4 feet underground. You can collect over a half gallon of water per inch of rain fall for every square foot of roof that you have. Add it up because that is a lot of water, even for folks with smaller roofs! 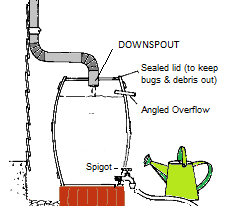 For most, just run an extension from the gutter downspout directly into the tank. The tank can have a release valve at the bottom to drain or you can even utilize a pump for this purpose. If you use a pump you can get even more creative, as gravity won’t be a necessity anymore. so make sure you clean out your collection basin periodically. A best practice is to also completely drain it at least once a year and clean it thoroughly with bleach or another antibacterial soap to prevent algae growth. Keep a close eye on the tank to make sure the winter hasn’t caused any cracking or other damage. make sure everything is properly secured and won’t tip over when it gets full with water. If at all possible, keep the tank covered to prevent bird droppings or insects from getting into it. Needless to say this water is best used for gardening or other similar purposed NOT TO DRINK. As you get more advanced you can add a filtration system to the array. Depending on the quality it will allow you to use your newly acquired water for a variety of purposes. Rain water tends to be a little more acidic so make sure and test the PH if needed. Another fun project is to create an aquaponics system and use the rainwater to run it. Check out this link to read further about the endeavor!